Just two weeks out from the US election it may be worth noting a promise made by Mitt Romney during the first debate held in Denver on the 3rd October 2012. He stated that “If I’m president, I will create, help create 12 million new jobs in this country with rising incomes”. This is a big promise. Let’s put aside the promise about rising incomes (as the Economist recently noted US median incomes have reversed over the last 15-years after peaking in 1999) and unpack some of the data in relation to US employment. If he were to win the US Presidency Mr Romney’s administration would need to create 250,000 new jobs per month which would equal 750,000 per quarter or 3-million per year. Figure 1: US Employment gains & losses by quarter (please note that Q1 is Jan – Mar). Data sourced from the US Bureau of Labour Statistics. Over the past 10-years and nine-months (129-months of data) there have been just 11-months where employment gains exceeded 250,000. To be fair April 2004 had a gain of 249,000 so let’s allow that one as a conceded pass thus increasing the total to 12. There have only been two periods where the employment increased at more than 250K in consecutive months, that is the first quarter of 2006 (during the height of the pre-GFC period) and the first two months of 2012. On the negative ledger the months where employment losses exceeded 250,000 also tally 12. Between August 2008 and July 2009 the US economy officially shed 6.874-million jobs over 12-months. Over the past 10-years no other month saw a loss of more than 250,000 except for that period. In terms of quarterly data there have only been two quarters where employment increase by more than 750,000 (Q2-2005 and Q1-2006). 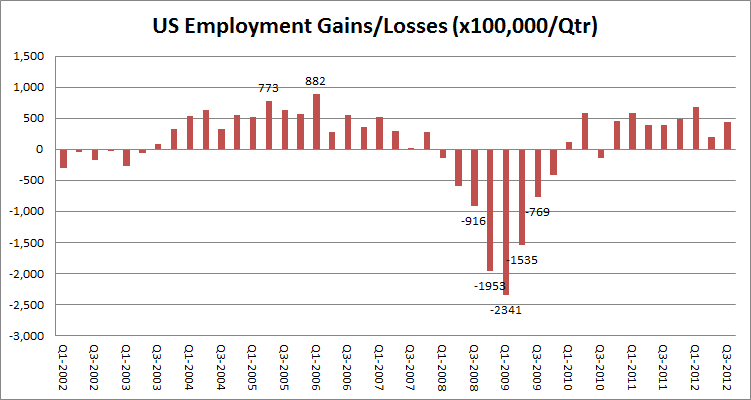 On the negative side the period Q3-2008 through to Q3-2009 were five consecutive quarters where job losses exceeded 750,000. In the first quarter of 2009 the US economy lost more than 2.3-million jobs, more than three times the Romney target but moving in the wrong direction. 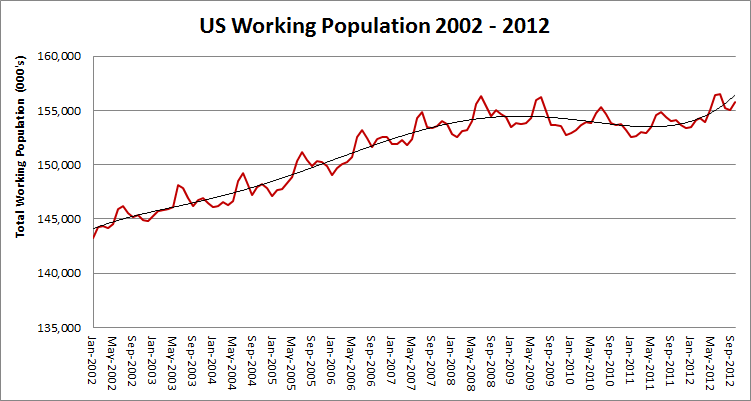 Figure 2: US Working Population 2002 – 2012 (updated with October 2012 data). Data sourced from the US Bureau of Labour Statistics. To add to both Mr Romney and Mr Obama’s concerns are not just creating new jobs but also keeping pace with new entrants to the workforce which I would estimate could be between 300,000 – 900,000 per annum depending on how you might calculate the increase. For all the talk of the impending crunch time due to baby boomer exits there has been a sustained increase in the US working aged population over the past decade as shown in Figure 2. The red line reflects BLS actuals, an increase of 10-million workers in the past decade. The black polynomial trend-line I’ve added to highlight the incline-decline-incline impacts of the GFC. However way you cut it, even a minimum increase in new entrants adds another 10% to the annual job creation burden. In economics we have a saying. Unemployment goes down the elevator but re-employment has to climb the stairs. Just looking at these two graphs highlights some of my concerns with Mitt Romney’s aspiration of creating more than 250,000 jobs over a sustained 48-month period. Looking at the data, even in the best of times the task would have been incredibly hard. I still think the global employment situation has a lot of downside risk. Even with recent improved employment data I don’t believe the US is out of the woods yet, in fact I suspect we might see further soft, even negative employment data next year in the US. For Mitt, if he were to get over the line I would suggest he might have promised in haste and will regret in leisure. Update (6/11/2012): Given the recent discussion around the US unemployment figures for October, which showed a provisional increase of 171,000 non-farm jobs but an overall rise in the unemployment figure from 7.8% to 7.9% I thought an update of the US Working Population graphic would be useful. Between September and October 2012 the US Working Population (those in the civilian labour force) actually increased from 155,075,000 to 155,779,000 or an increase of 704,000. Interestingly, the available Working Population figure was at its highest in Jul 2008 at 156,300,000 so although this months figures may seem high to some there is still a reasonable amount of elasticity in this number (thus it doesn’t represent a truly high figure at this stage).